"Lost & found" ads are inter related because, if you have lost something, there is someone who has found something, which could possibly be yours. When you lose your personal & valuable belongings, it is definitely a time for worries because these documents are not so easy to be re obtained. 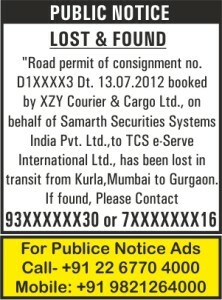 However, what can be done as a last effort is to place an advertisement in the newspaper in the "lost & found" section. This section serves an important and noble purpose too. Just imagine someone calling you, after seeing your ad, to return your lost document. How reliever you would be, isn't it. So, that possibility cannot be ruled out. It can very well happen with you .We at Riyo Advertising will lend you a helping hand in looking for your important and most valuable document/ things. An advertisement in the "lost and found" section in the newspaper can help you apply for a duplicate copy of the same; and most importantly, the finder can contact you. Depend on Riyo Advertising; we are always glad to be a helping hand. A Missing person's ad is also part of the Lost & Found section. While advertising for a missing person in the newspaper, it is mandatory to produce a complaint copy (FIR) related to the missing person. Other supporting documents too are required to establish the identity of the missing person. We at Riyo advertising will assist you with all the formalities needed to place a missing person's ad. Riyo Advertising is an authorized agency for all leading Indian newspapers in English, Hindi and other Regional languages. 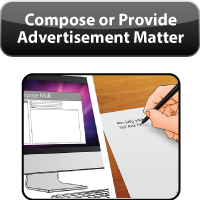 Publish your Lost & Found advertisement in "Classified Text lineage" or "Classified Display". Riyo Advertising does not charge for Art works (sample works). 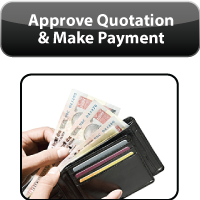 Riyo advertising offers Online & Offline booking & payment Option for newspaper advertising. We have our in-house team of experts to guide you. "Riyo Advertising" is just a call away. To help you find your documents, contact "Riyo Advertising" customer care team on 022-6770 4000 / 022-67706500 / 9821254000 or email us on info@riyoadvertising.com. This is a sample of a Lost & and Found add. Here, the ad makes a mention about the School certificates being lost by the said person. The details about the certificates and the roll numbers etc are mentioned as part of the requirement. The ad placed is for about three examination certificates that are lost by the advertiser (person).This is a general procedure that has to be followed in order to apply for a duplicate copy.